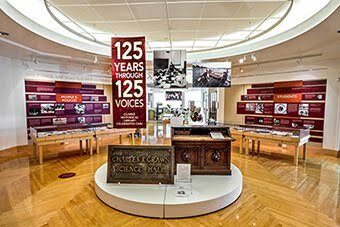 On October 19, The Clarke Library sponsored two programs celebrating the Michigan Natural Resources Trust Fund (MNRTF)’s 35th anniversary. Perhaps one of the best kept secret in state government, over the past 35 years the Fund has pumped over $816 million to acquire and improve Michigan public recreation and environmentally sensitive properties across the state. At 2:00 p.m., four panelists, Michigan Oil and Gas Association (MOGA) President Frank L. Mortl, Michigan Natural Resources Trust Fund Board Chairman Bob Garner, Michigan United Conservation Clubs (MUCC) Executive Director Erin McDonough, and Michigan Chapter of the Nature Conservancy Director Helen Taylor, spoke about the Fund’s founding, history, and impact. Their collective presentations drew a portrait of one of the most successful political compromises made in the last generation. The Trust was born out of political compromise. A major discovery of natural gas in the northeast corner of the Lower Peninsula made oil companies very anxious to begin widespread drilling, while environmentalists fought vigorously to keep development away from what was a largely wilderness area. As the battle raged on, the senior representatives of the two communities, Frank Mortl of MOGA and Tom Washington of the MUCC cut a deal. MUCC would support drilling – MOGA would support creating a Trust Fund into which all revenue received by the state as a result of oil and gas production would be set aside to fund outdoor recreational activity and the purchase of environmentally-sensitive land. Both men took their share of grief for the compromise, but with the support of each organization the enabling legislation became law. The results have proved a huge benefit to the people of the state. Vast tracts of land have either been protected or developed into or benefited from improvements made to outdoor recreational sites. Fishing piers and marinas have been built or rehabilitated. Environmentally fragile land has been protected. The panelists gave a fascinating insight into both the process of political compromise and the benefits that can accrue to society when groups with seemingly unresolvable conflicts think creatively about how to find common ground. Then as now, compromise was not necessarily popular, but it worked, and worked very well to serve the long-term interests of the public. An added, an unexpected feature of the program was an unplanned set of comments made by special guest Howard A Tanner. Tanner, now 87 years of age, as then director of the Department of Natural Resources, had played a key role in implementing the MNRTF. Tanner talked primarily about what he saw as the essential breakthrough represented by the Trust: that funds received by the state as a result of the depletion of a state-owned, non-renewable resource, should be used to acquire for the public’s benefit additional non-renewable resources – primarily prime recreation land and land of special environmental sensitivity. Like any compromise the MNRTF was a trade-off, but one that replaced a non-renewable asset underneath state-owned land with a new asset, prime recreation land and the protection of the environment, that would benefit the public for generations to come. 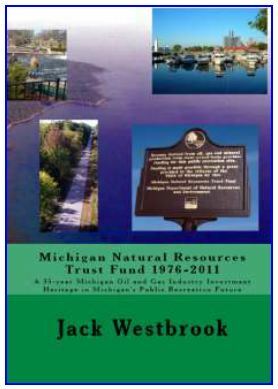 This wonderful panel that brought together some of the most influential people, past and present, in the state’s environmental history, was followed Thursday evening by author Jack Westbrook discussing his recently published book, Michigan Natural Resources Trust Fund, 1976-2011.While the panel dealt with the general good accomplished by the Trust Fund, Westbrook brought home the true impact of the Fund by looking at many of the projects it has funded. From funds spent to acquire the tip of the Keweenaw Peninsula for public use to funds spent to improve recreational facilities on Detroit’s Belle Isle Park, residents throughout the state have personally benefitted from projects made possible by the Trust. As Westbrook noted, the Trust has become a model other states have attempted to emulate; a solution “made in Michigan” to resolve one of the most vexing problems of our time.